Yield: Yields about 10 dozen 2-inch cookies. 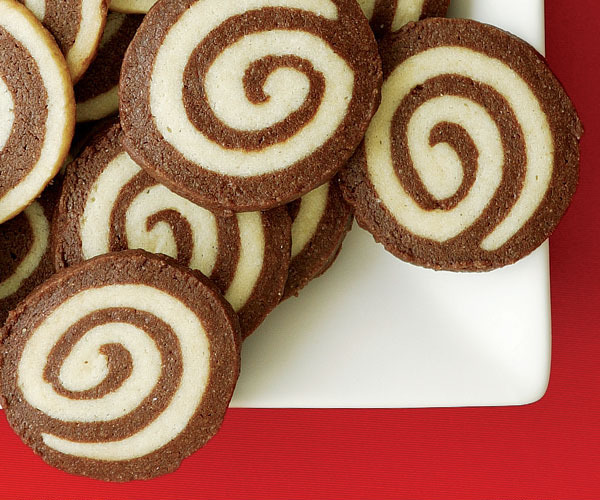 These fun cookies, with their spirals of chocolate and vanilla dough, are perfect for Christmas or parties. 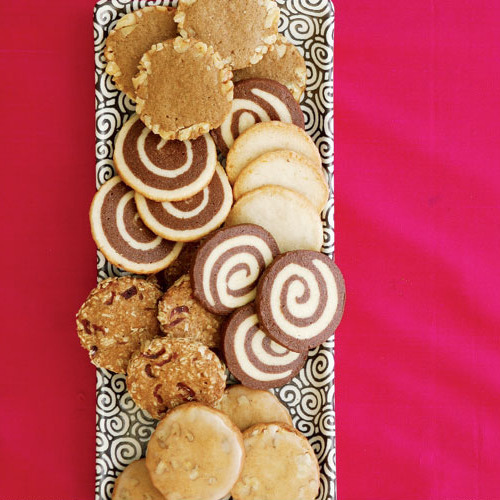 Watch the playback of our Virtual Cookie Exchange, where Denise Mickelsen demonstrates how to get a well-defined design on the cookies and offers up her secret to keeping the pinwheel log rounded in the freezer. Portion each flavor of dough into three equal pieces. (For accuracy, use a scale.) 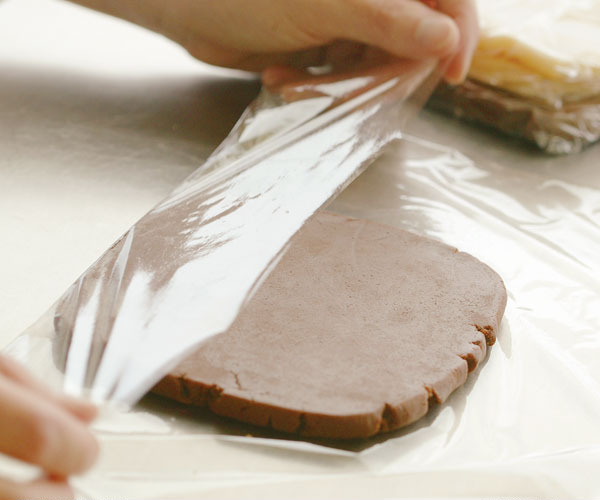 Shape each piece into a 5×5-inch square on a piece of plastic wrap and wrap well. The chocolate will be thicker than the vanilla. Refrigerate the dough for 30 min. (If the dough becomes too hard, let it stand at room temperature for a few minutes before rolling). While the dough is chilling, tear off twelve 12-inch squares of waxed paper. 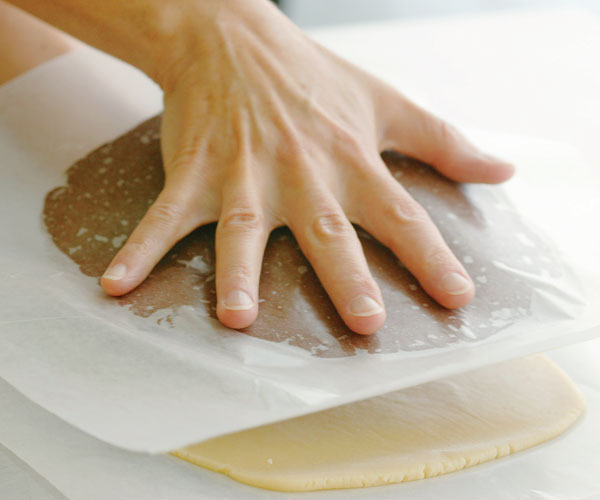 Roll each piece of dough into a 7×7-inch square between two sheets of the waxed paper. 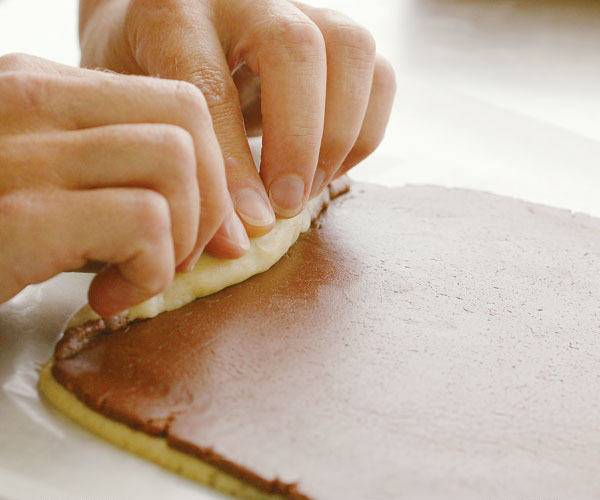 Without removing the waxed paper, layer the squares of dough on a baking sheet and refrigerate for 10 to 15 min. Have ready three 15-inch sheets of plastic wrap. 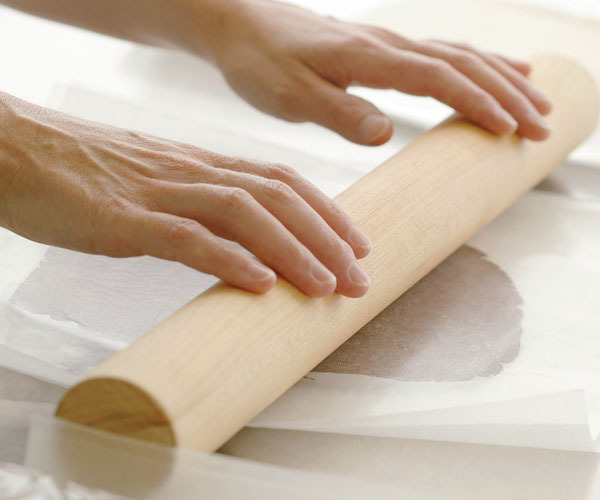 Using the waxed paper as an aid, continue rolling the dough into a tight cylinder. After the cylinder is formed, roll it back and forth on the counter to slightly elongate it and compact it. Transfer the log to the plastic wrap, centering it on the long edge closest to you. Roll tightly, twisting the ends of the plastic firmly to seal. 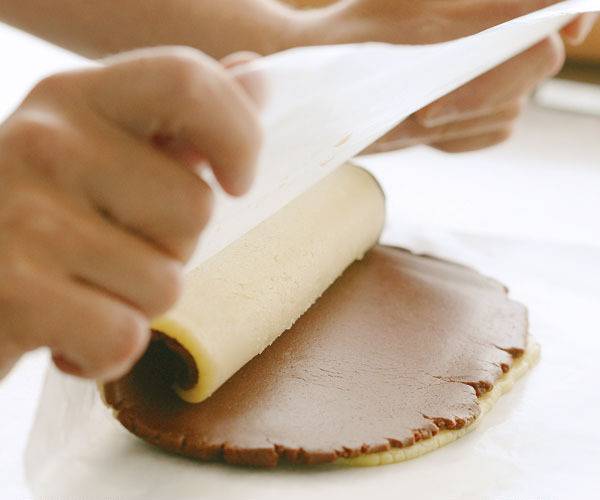 With your hands on either end of the log, push firmly toward the center to compact the dough. It should be about 9 inches long and 1-1/2 inches thick. Repeat with remaining dough. Refrigerate the logs until firm enough to slice, about 3 hours, or freeze for up to three months. Position racks in the upper and lower thirds of the oven. Heat the oven to 350°F. Line two rimmed baking sheets with parchment. Working with one log at a time, use a sharp, thin-bladed knife to slice the dough into 3/16-inch rounds. Set the rounds about 1 inch apart on the prepared pans and bake until the tops of the cookies feel set, 12 to 14 min. (don’t let the edges become too brown). To ensure even browning, rotate the sheets as needed during baking. Let the baked cookies stand for 1 minute on the pan. While they’re still warm, use a thin metal spatula to transfer them to racks. When cool, store between sheets of waxed paper in an airtight container for up to two weeks, or freeze for up to three months. Following this recipe I ended up with a dough that was too crumbly to work with. This means to me there isn't enough liquid to flour ratio. I just added cold water until I had a dough the consistency that I desired, however it was still a very difficult dough to work with. Lets be clear: ONE AND ONE QUARTER cups of sugar, not 11/4 cups. Sloppy writing. A lot of work and the flavor was not as good as I'd hoped. OK, but nothing exceptional. I must have messed up in the measurements because the cookies were cute, just like the picture, but only slightly larger than a quarter! I assume they are supposed to be larger than that.